The recent ruling by Malaysia’s highest court to restrict non-Muslims from using the word ‘Allah’ has triggered a wider national debate deepening polarization among the country’s various ethnic and religious communities. Malays, the country’s dominant ethnic group, are constitutionally ascribed as Muslims from birth, and their language borrows many terms from Arabic, including ‘Allah’. Malaysia, along with neighboring Brunei, are among the only countries in the world to regulate the use of the word ‘Allah’ and other terms deemed to be exclusive to Islam among its non-Muslim citizens. 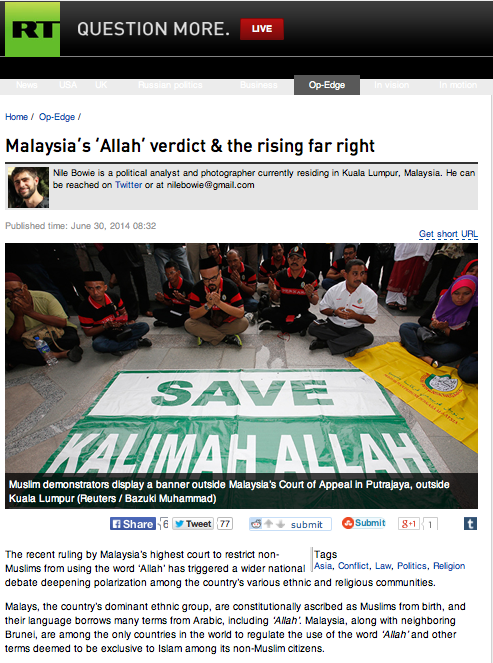 A court ruling in 2007 prohibited a Catholic newspaper, the Herald, from using ‘Allah’ to describe the Christian god in the local Malay-language edition of its newspaper. In its attempts to appeal the judgment, the Church has argued that Christians in the Muslim-majority nation have used ‘Allah’ in Malay-language bibles and daily prayers for centuries. Although the prohibition of the term only applied to the Herald newspaper, religious authorities in the state of Selangor took the unprecedented step of raiding the offices of the Bible Society of Malaysia in January, confiscating 321 Malay-language bibles on the basis that public disorder would ensue unless ‘Allah’remains exclusive to Islam. The Selangor Islamic Religious Council refuses to return the bibles, in defiance of the country’s attorney general. When a lower court ruled in favor of the Church to reverse the government ban in 2009, widespread anger ensued that saw arson attacks and vandalism at churches, temples, and other places of worship. The Court of Appeals reversed the lower court’s decision in 2013, which prompted the Catholic Church to bring their case to the Federal Court, which rejected their challenge in a 4-3 judgment last week.